The new CORKO Wine Chiller Stick is a must have for any wine drinker. Open your bottle of wine, and insert the Wine Chiller to keep it cold during the duration of your bottle. Additionally, the Chiller has a built-in aerating pourer cap, allowing for a smooth, delicious, mess-free pour. This wine accessory is perfectly engineered to keep your wine cool, and to fit all bottles. Once you use the CORKO Wine Chiller stick, you'll never open a bottle of wine without having it close by. We use our own Chiller Sticks on red and whites alike, and it helps ensure delicious flavor throughout the whole bottle. As with all CORKO Wine products, the wine bottle chiller comes with a lifetime warranty. Anytime you have any issues at all, email us at support@corkowine.com and we will send a replacement out same day. This product is new to the market, so many wine lovers still don't have one in their kitchen or bar. If you are looking for a gift for a wine-o, look no further. CORKO's Wine Chiller stick will be appreciated, and enjoyed. HIGHEST QUALITY WINE CHILLER. 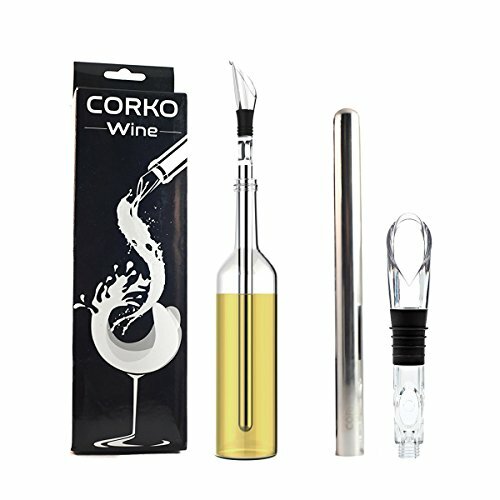 The CORKO Wine Chiller stick, with an aerator pouring cap, fits all bottles. TOP NEW WINE ACCESSORY. This premium Wine Chiller will keep your wine cool, and has an engineered pouring cap. Open your bottle, drink a bit (so you don't lose any wine) and stick in the wine chiller stick for a perfect wine drinking experience. GREAT WINE GIFT. This beautifully packaged, easy to use wine bottle chiller serves as a perfect wine drinker's gift, for any occasion. EASY USE, STORAGE, AND CLEANING. Open your bottle, drink a bit to avoid spillage, and insert the CORKO Wine Chiller stick. Once your done, simply hand wash the chiller stick, and place back in the freezer until next use. If you have any questions about this product by CORKO Wine, contact us by completing and submitting the form below. If you are looking for a specif part number, please include it with your message.